Additional Info: Dr. Chris Fowler is an eclectic musician who is as comfortable with a baton in his hand as he is behind a keyboard. He holds the Bachelor and Master of Music degrees from Georgia State University where he was honored as the first recipient of the Haskell L. Boyter Scholarship for excellence in the choral art. While at Georgia State, Dr. Fowler studied voice with Betty Boone and he served as a vocal lab accompanist for Florence Kopleff for three years. He performed a double senior recital in voice and piano. He also holds the Doctor of Musical Arts degree from the University of Georgia, where he was the recipient of the prestigious Dr. Gene Simons Fellowship Award. He is also a member of the Pi Kappa Lambda National Music Honor Society. Dr. Fowler, an Atlanta native, is an active performer in many musical styles. He is comfortable with anything from Bach to Rock! His credits include performances as diverse as Baroque orchestral works on harpsichord, large scale choir and orchestra presentations, solo piano pieces (including his own arrangements), worship leading (in all styles, from traditional to blended to contemporary), and gigs with pop, rock, big bands, and country bands around the greater Atlanta area for over three decades. He is an outstanding reader who also knows how to improvise when the situation is appropriate. Dr. Fowler has served as a frequent accompanist to district honor choruses, as well as having served as the accompanist for the Georgia All State Reading Chorus for all but two years of its existence. He has served as an accompanist for the Georgia All State Chorus for over twenty years, having served as a collaborative pianist for Dr. Anton Armstrong, Dr. Andre Thomas, Dr. Joe Miller, Dr. Tim Seelig, Dr. Jefferson Johnson, Dr. Dan Bara, and Dr. Deanna Joseph, among others. 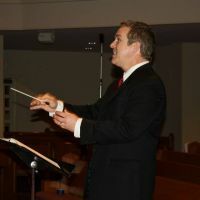 His conducting experience includes work with collegiate ensembles, adult community groups, church choirs and orchestras, as well as high school and middle school choirs. He has been a clinician at numerous honor choruses and festivals. Under Dr. Fowler’s direction, the Buford High School Choral Music Department has performed at the Georgia Music Educators Association state conference and at Carnegie Hall, and has won 100 GHSA Region Literary championships and 43 GHSA State Literary championships in the past 27 years. Fees: My fees are negotiable, depending upon your location, the difficulty level of the music, and the amount of time required for your rehearsals and performances.